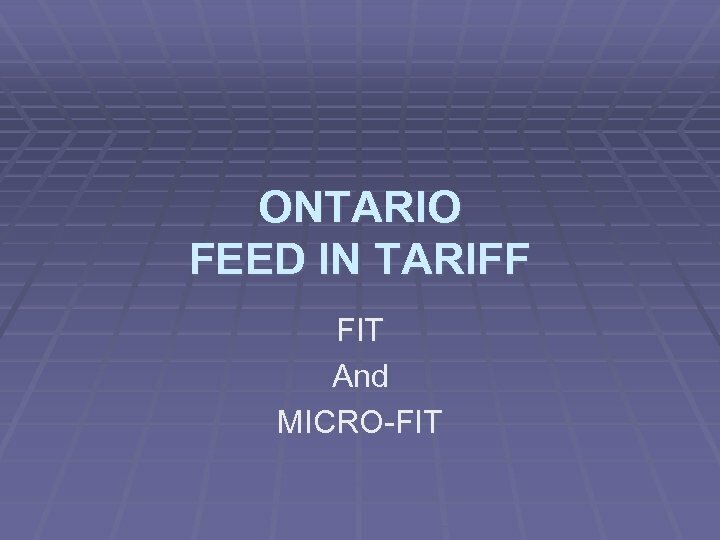 • Company based in Brantford. • Dan Cole - Owner and Manager. 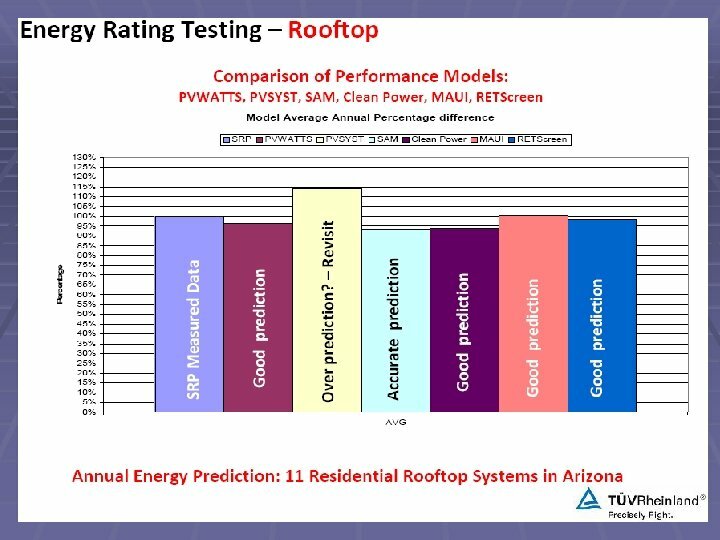 • Mike Triska – Engineering and Energy Audits. 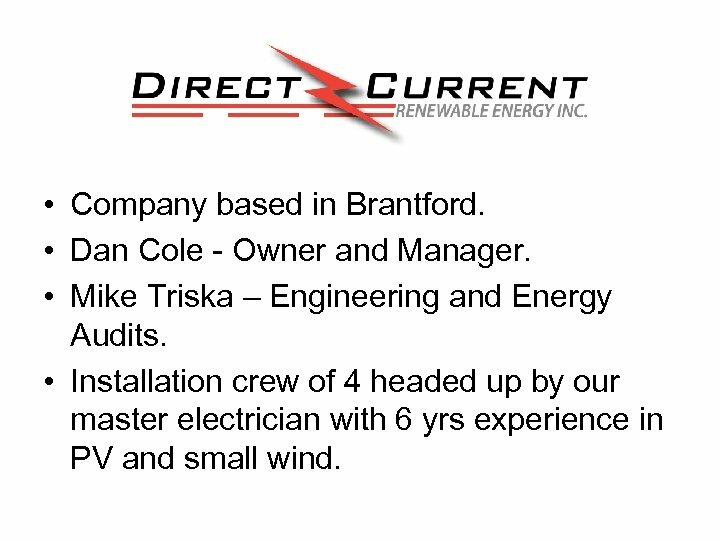 • Installation crew of 4 headed up by our master electrician with 6 yrs experience in PV and small wind. 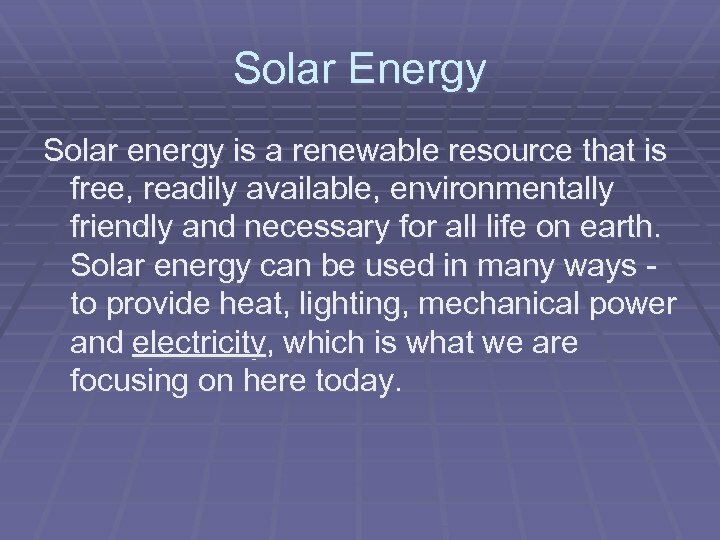 Solar Energy Solar energy is a renewable resource that is free, readily available, environmentally friendly and necessary for all life on earth. 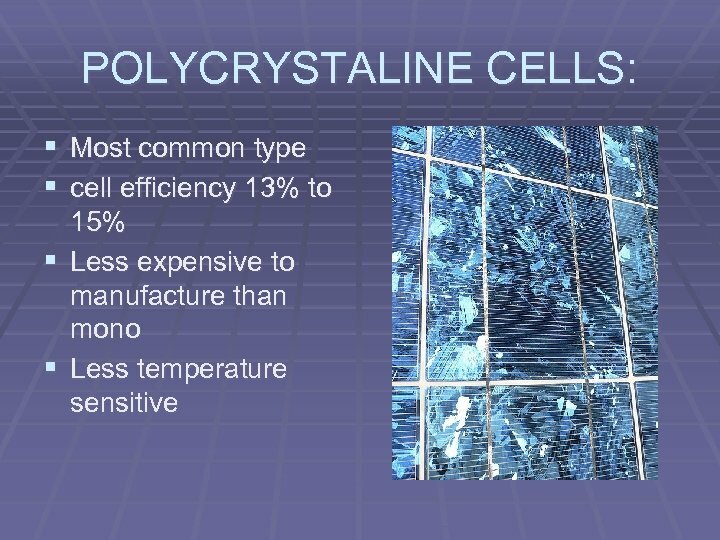 Solar energy can be used in many ways - to provide heat, lighting, mechanical power and electricity, which is what we are focusing on here today. 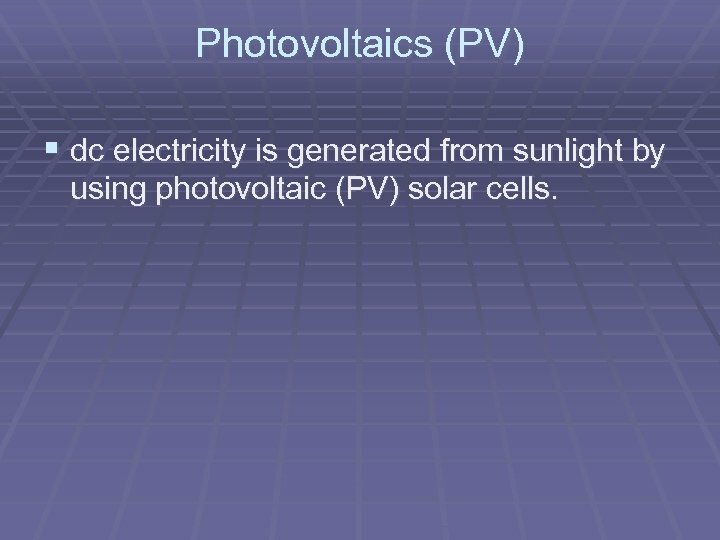 Photovoltaics (PV) § dc electricity is generated from sunlight by using photovoltaic (PV) solar cells. 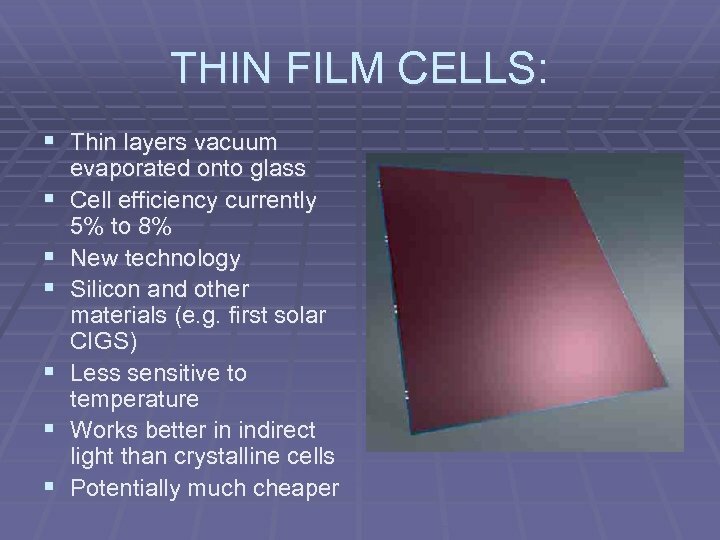 § These cells are semiconductor devices, usually made of silicon, which contain no liquids, corrosive chemicals or moving parts. 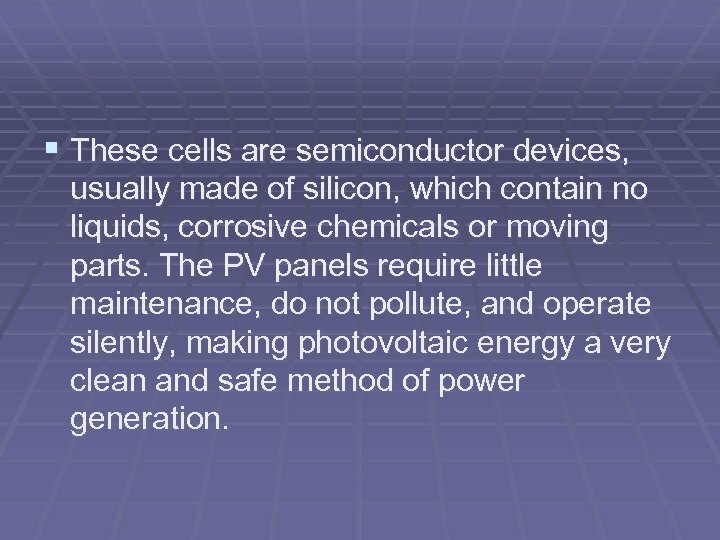 The PV panels require little maintenance, do not pollute, and operate silently, making photovoltaic energy a very clean and safe method of power generation. 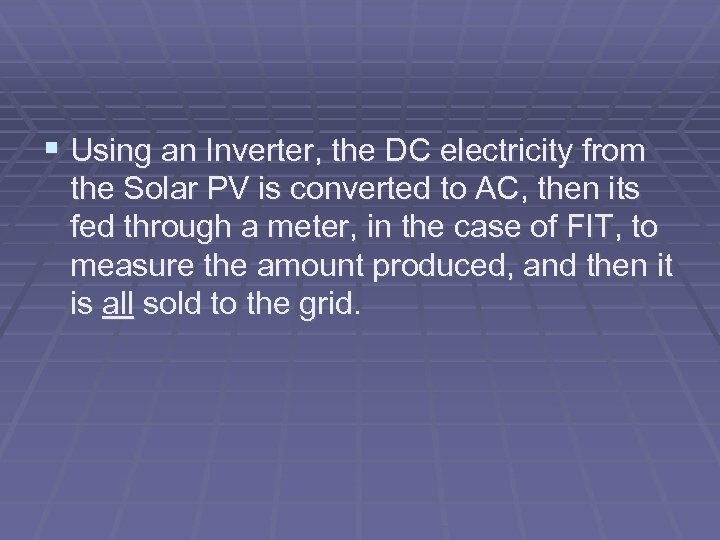 § Using an Inverter, the DC electricity from the Solar PV is converted to AC, then its fed through a meter, in the case of FIT, to measure the amount produced, and then it is all sold to the grid. 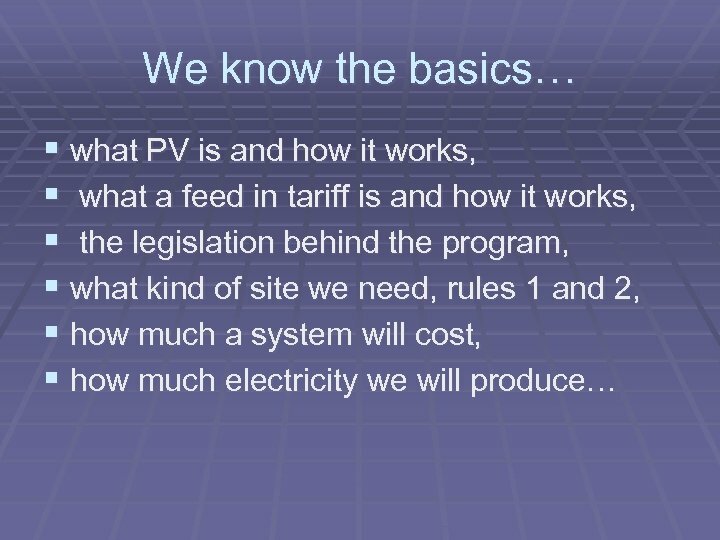 What is a Feed in Tariff? 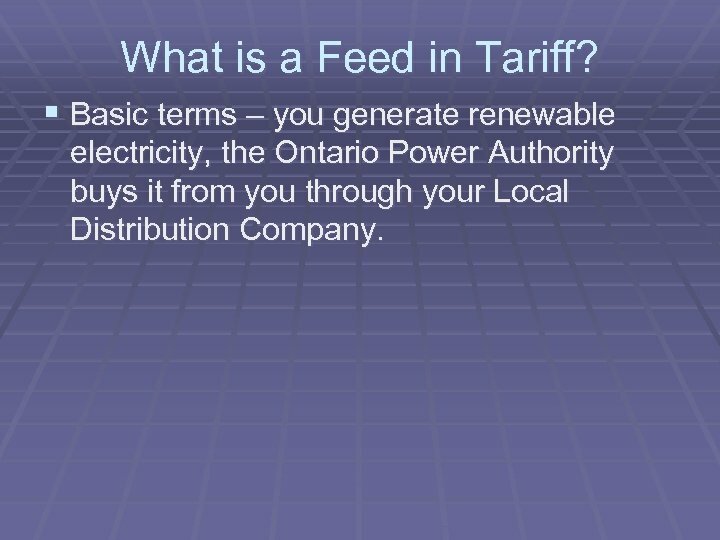 § Basic terms – you generate renewable electricity, the Ontario Power Authority buys it from you through your Local Distribution Company. 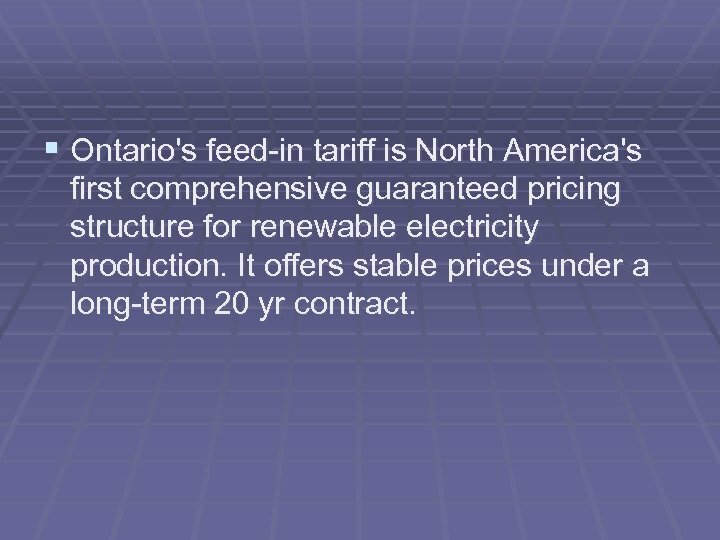 § Ontario's feed-in tariff is North America's first comprehensive guaranteed pricing structure for renewable electricity production. 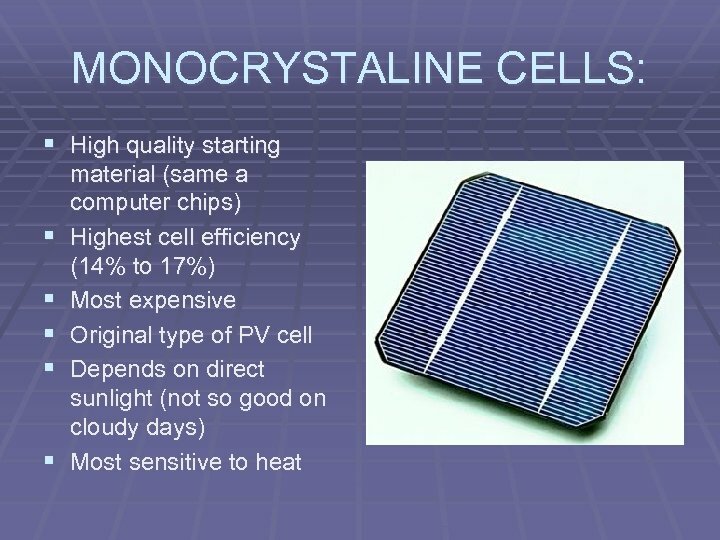 It offers stable prices under a long-term 20 yr contract. 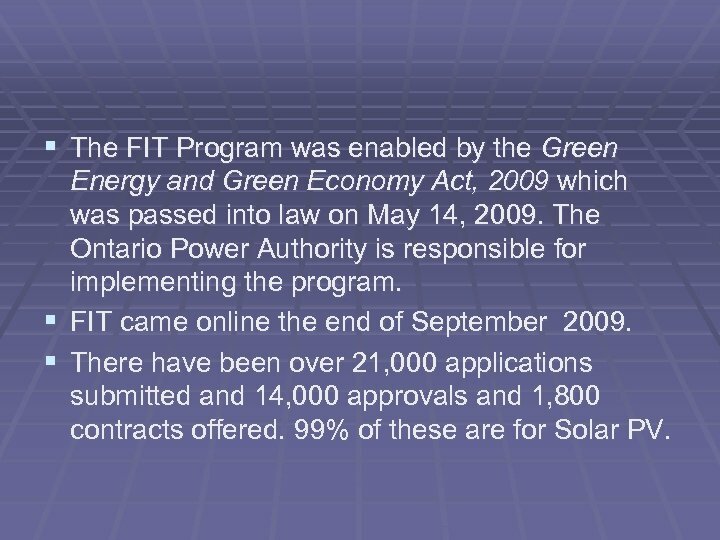 § The FIT Program was enabled by the Green § § Energy and Green Economy Act, 2009 which was passed into law on May 14, 2009. 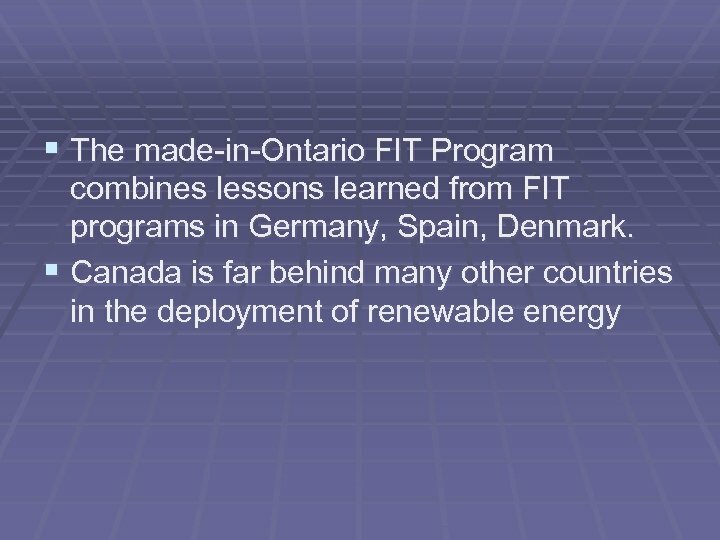 The Ontario Power Authority is responsible for implementing the program. 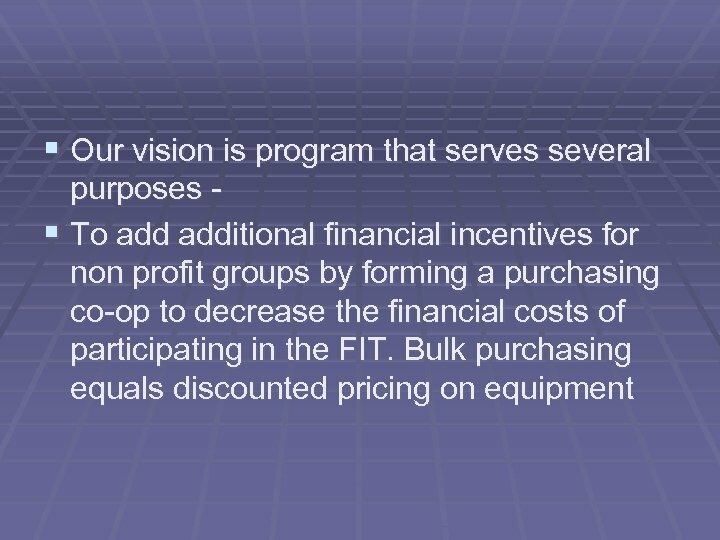 FIT came online the end of September 2009. There have been over 21, 000 applications submitted and 14, 000 approvals and 1, 800 contracts offered. 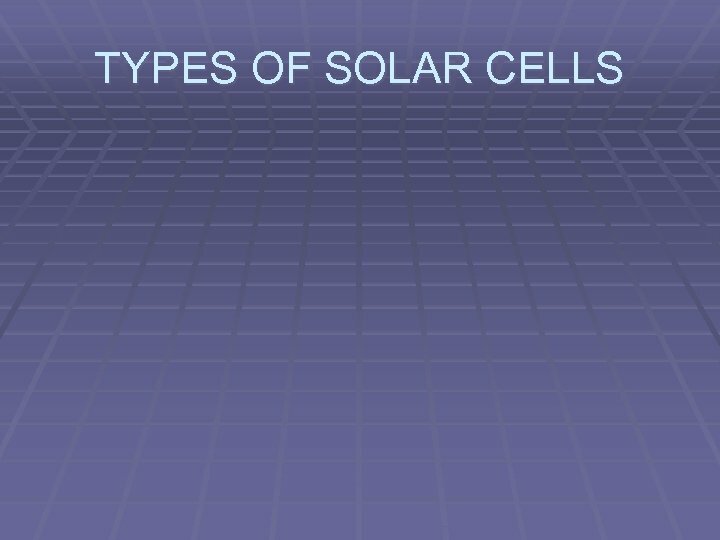 99% of these are for Solar PV. 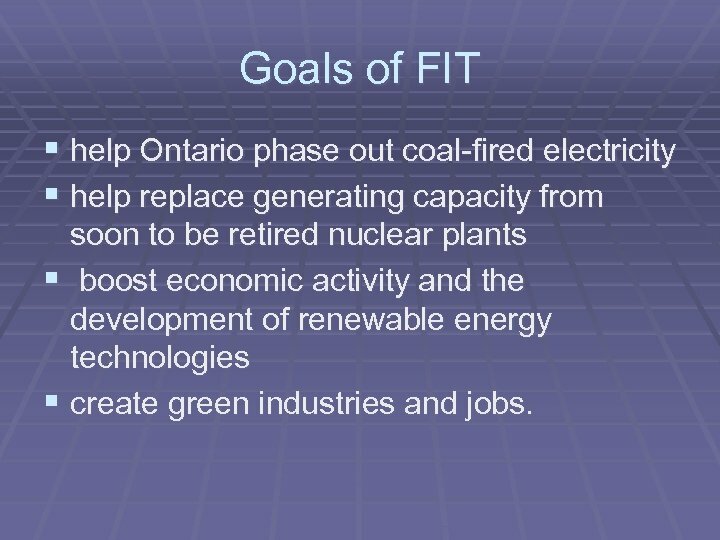 Goals of FIT § help Ontario phase out coal-fired electricity § help replace generating capacity from soon to be retired nuclear plants § boost economic activity and the development of renewable energy technologies § create green industries and jobs. 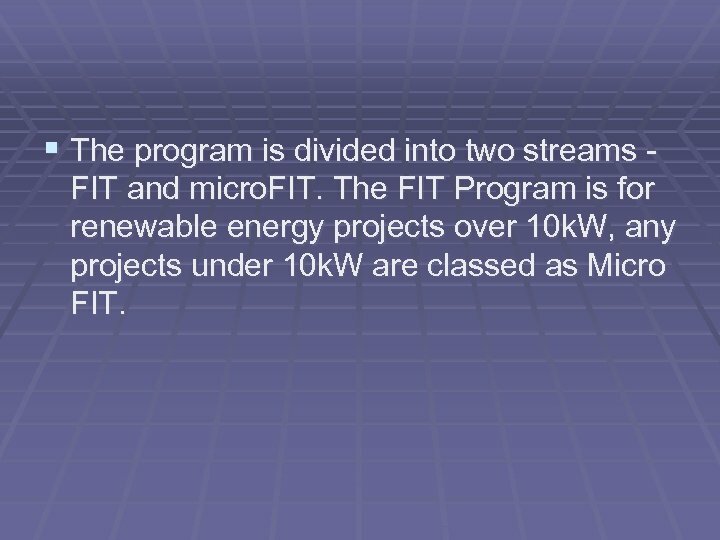 § The program is divided into two streams - FIT and micro. FIT. 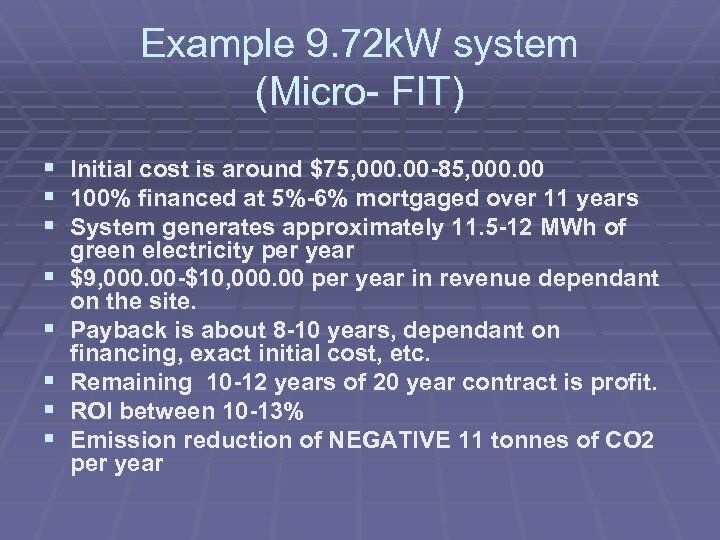 The FIT Program is for renewable energy projects over 10 k. W, any projects under 10 k. W are classed as Micro FIT. 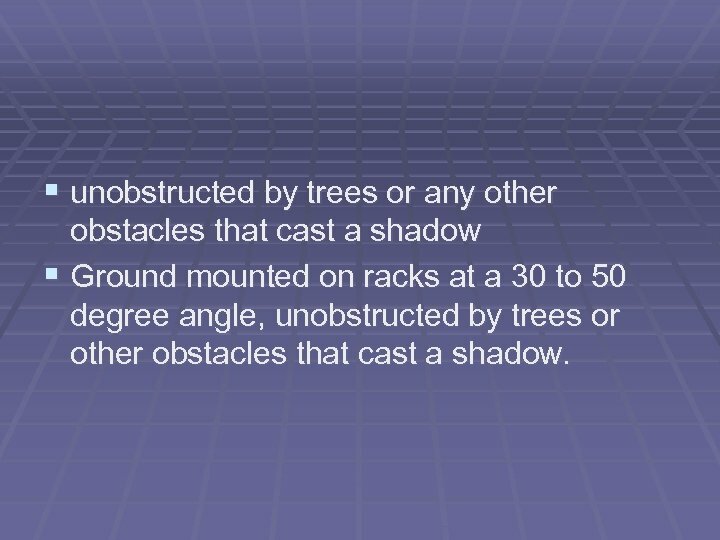 § unobstructed by trees or any other obstacles that cast a shadow § Ground mounted on racks at a 30 to 50 degree angle, unobstructed by trees or other obstacles that cast a shadow. 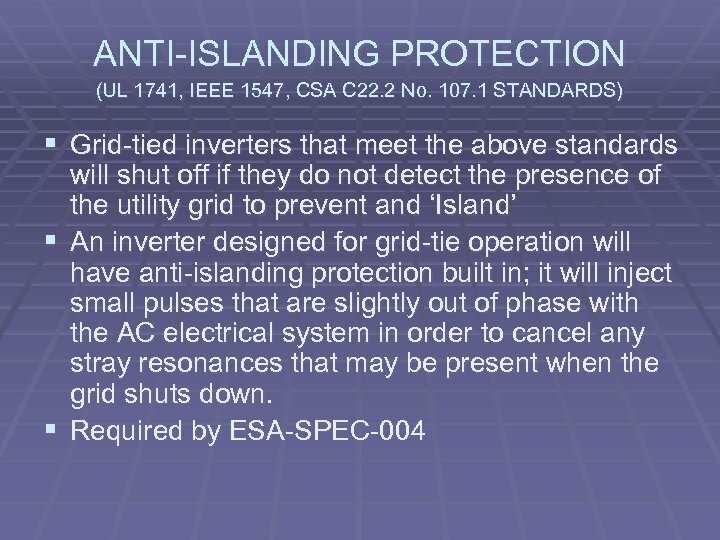 § Access to the grid is required to sell your green electricity. 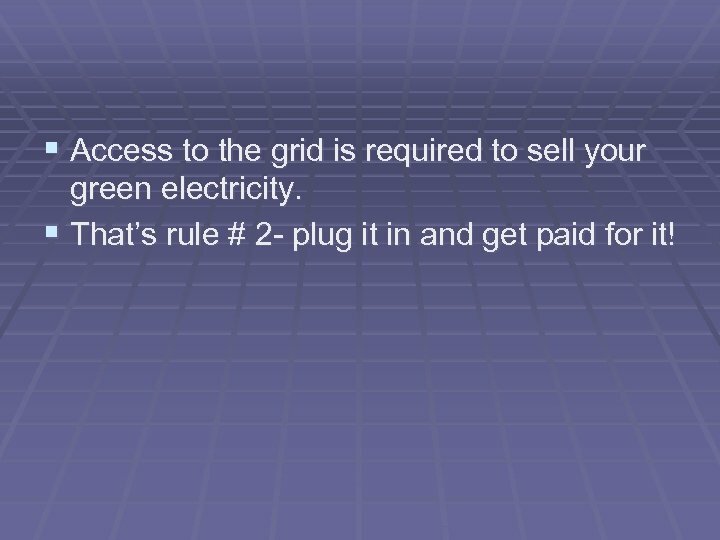 § That’s rule # 2 - plug it in and get paid for it! 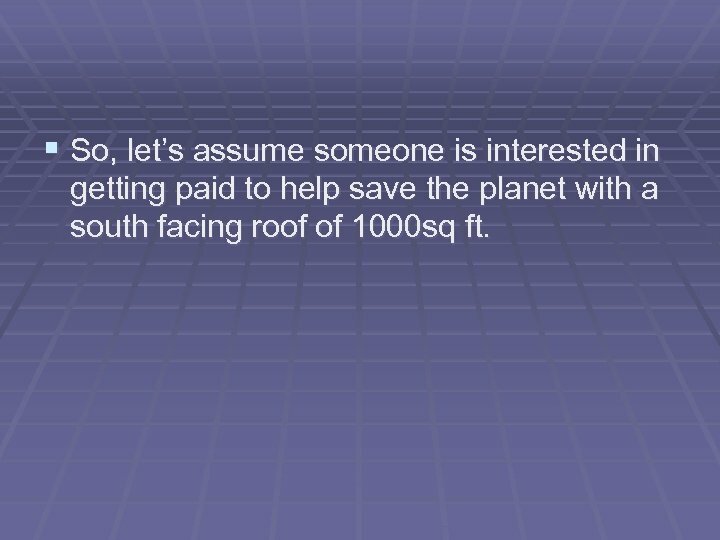 § So, let’s assume someone is interested in getting paid to help save the planet with a south facing roof of 1000 sq ft.
What is the cost? 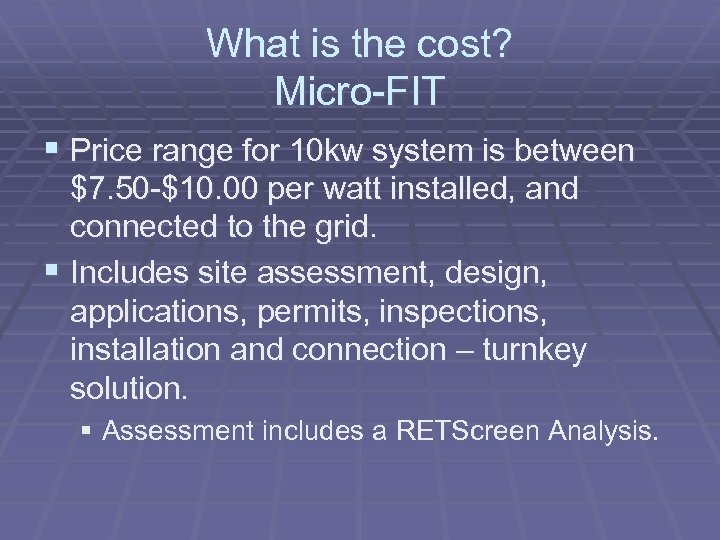 Micro-FIT § Price range for 10 kw system is between $7. 50 -$10. 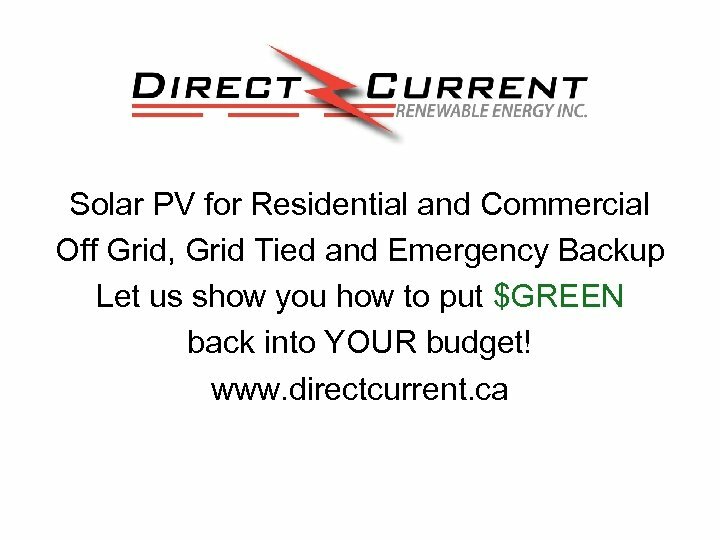 00 per watt installed, and connected to the grid. 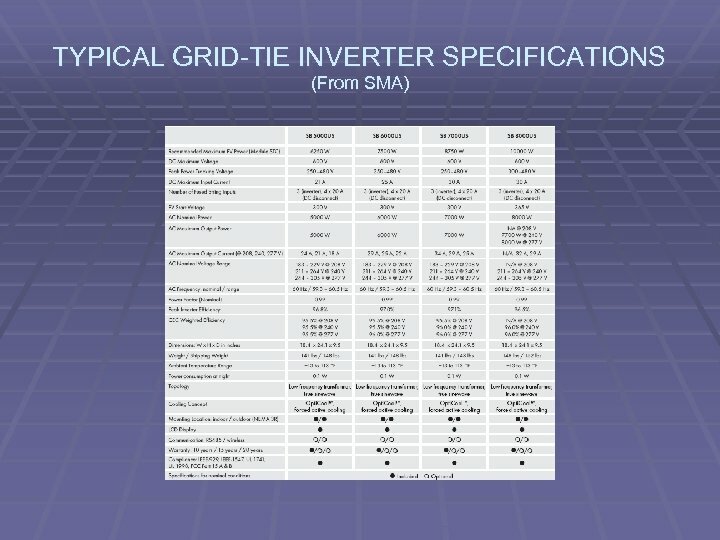 § Includes site assessment, design, applications, permits, inspections, installation and connection – turnkey solution. 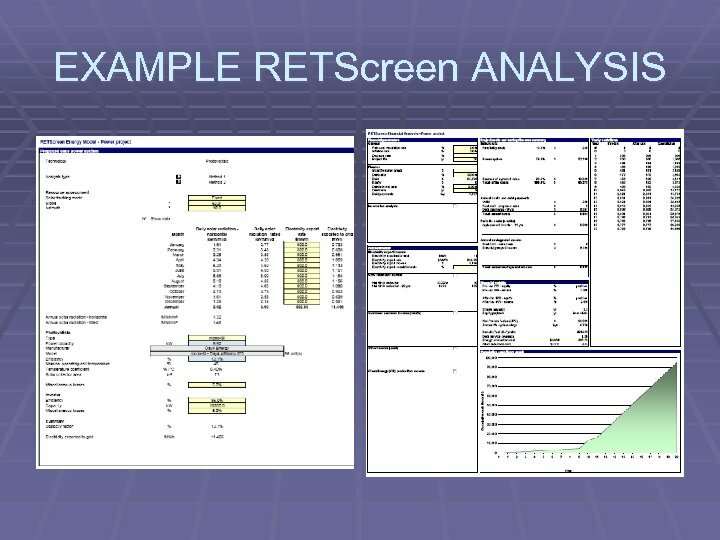 § Assessment includes a RETScreen Analysis. 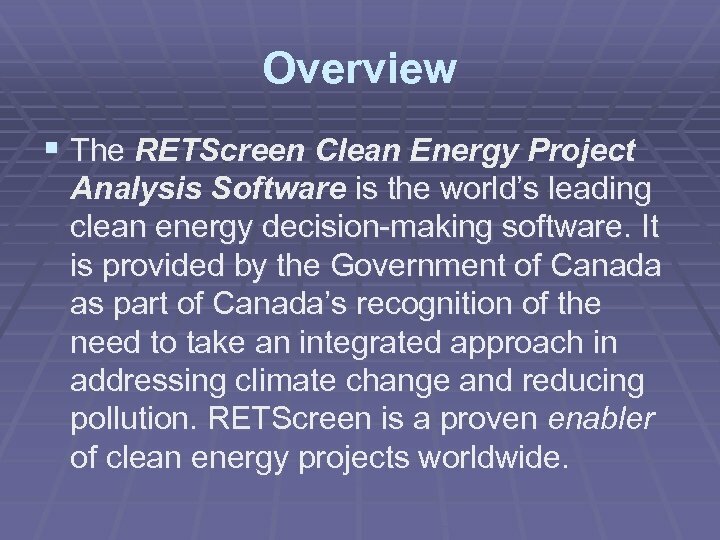 Overview § The RETScreen Clean Energy Project The Analysis Software is the world’s leading clean energy decision-making software. 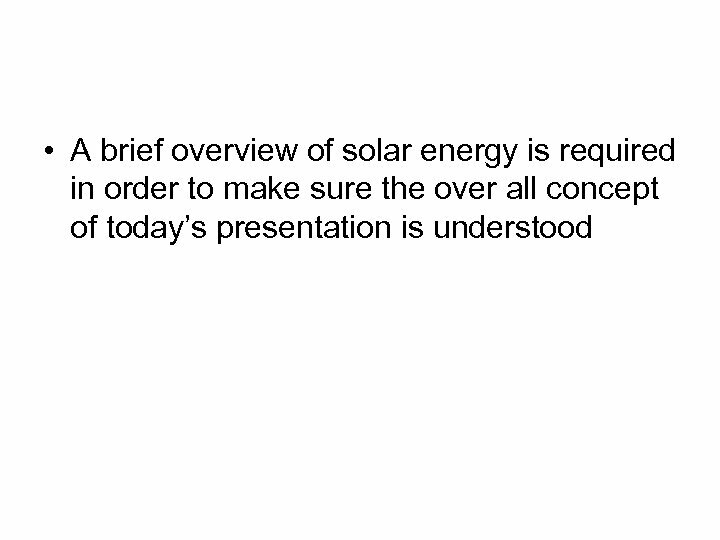 It is provided by the Government of Canada as part of Canada’s recognition of the need to take an integrated approach in addressing climate change and reducing pollution. 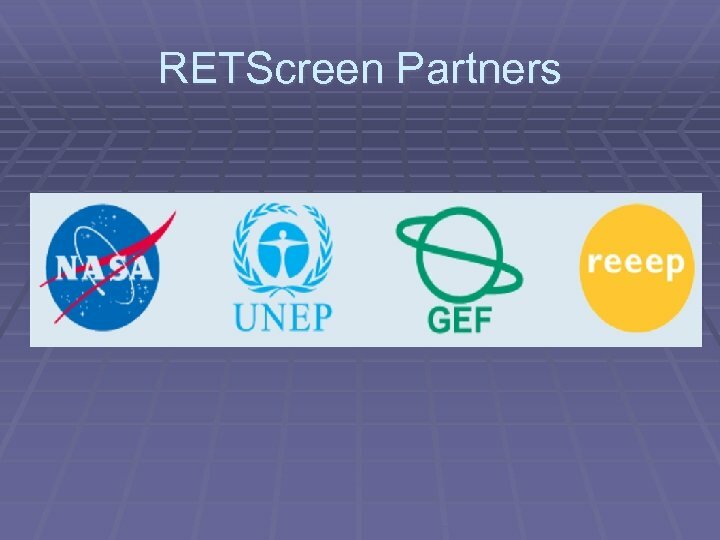 RETScreen is a proven enabler pollution. 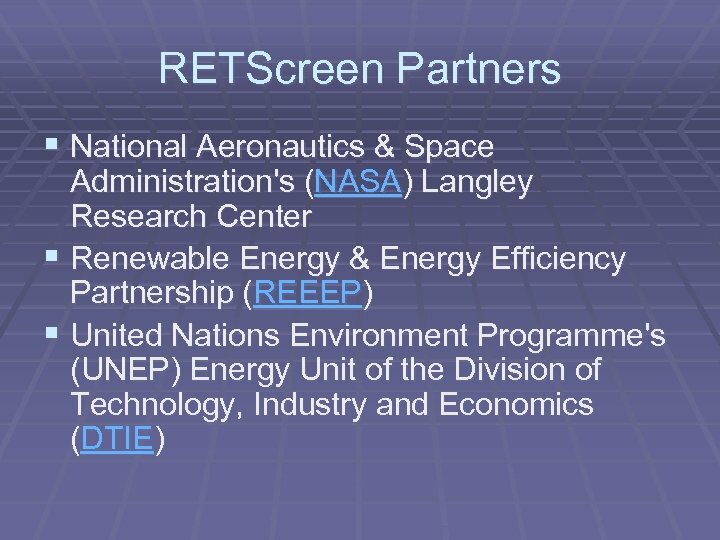 RETScreen is a proven of clean energy projects worldwide. 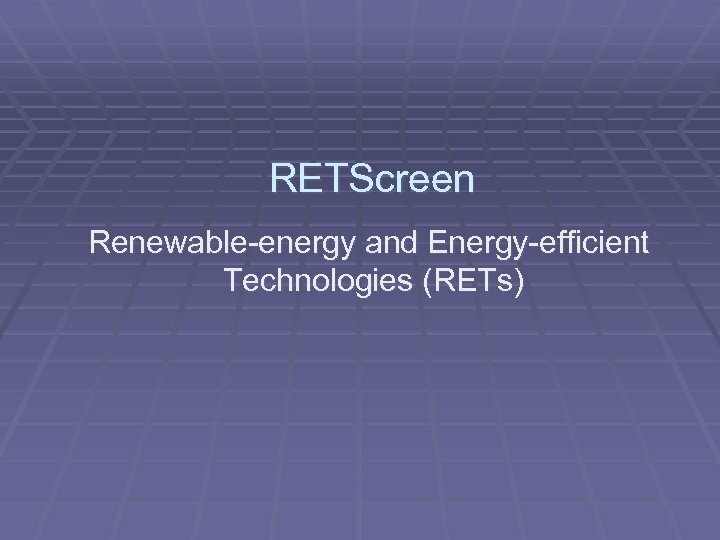 § RETScreen allows decision-makers and professionals to determine whether or not a proposed renewable energy project makes financial sense. 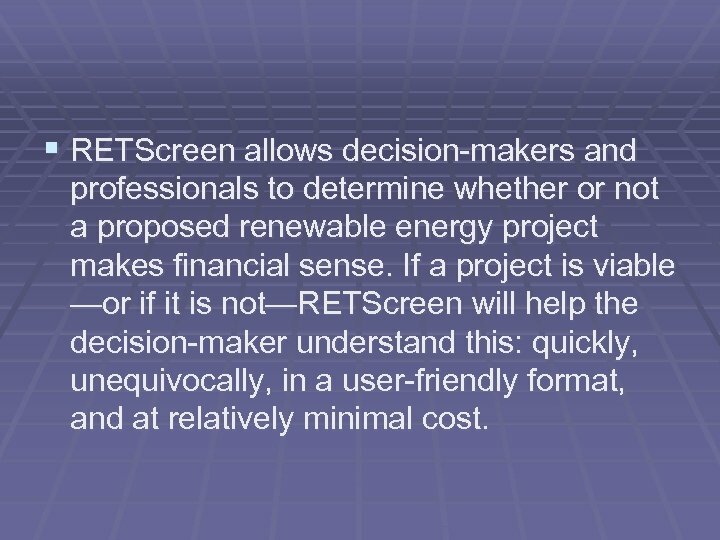 If a project is viable —or if it is not—RETScreen will help the decision-maker understand this: quickly, unequivocally, in a user-friendly format, and at relatively minimal cost. 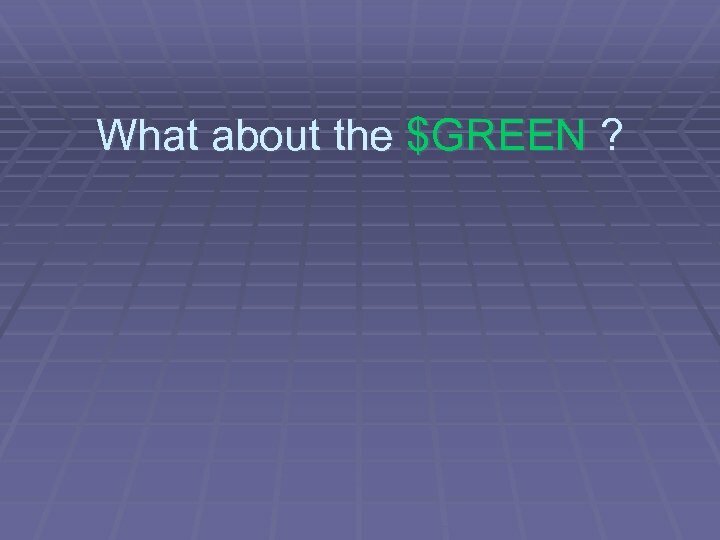 What about the $GREEN ? 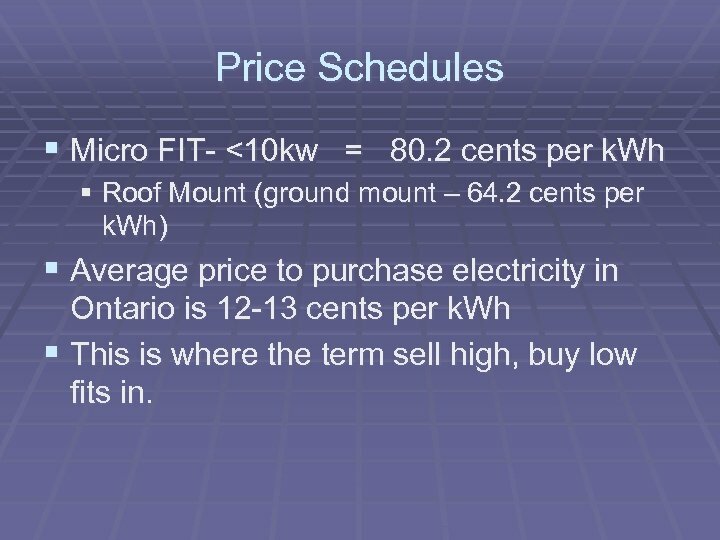 Price Schedules § Micro FIT- <10 kw = 80. 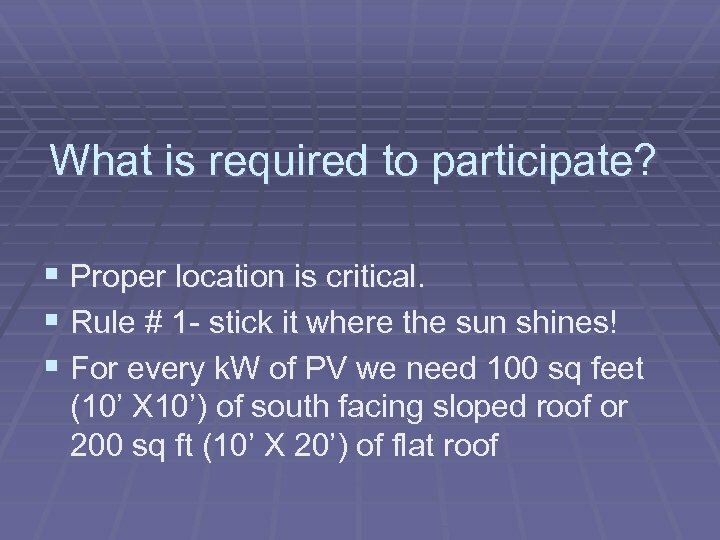 2 cents per k. Wh § Roof Mount (ground mount – 64. 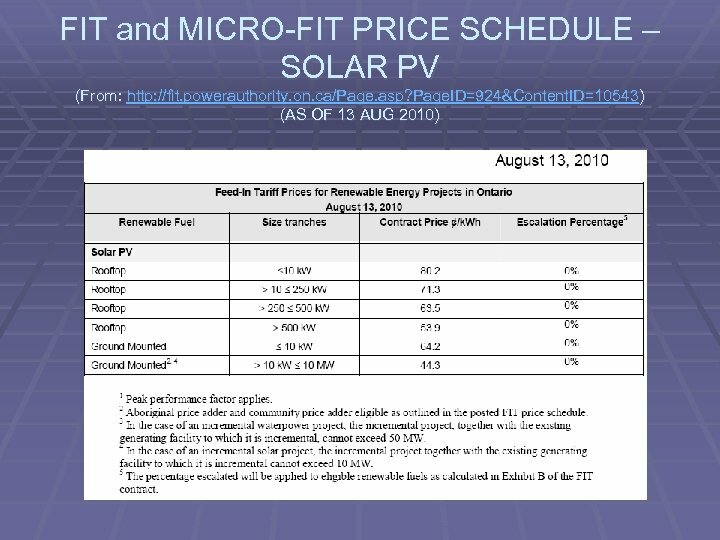 2 cents per k. Wh) § Average price to purchase electricity in Ontario is 12 -13 cents per k. Wh § This is where the term sell high, buy low fits in. 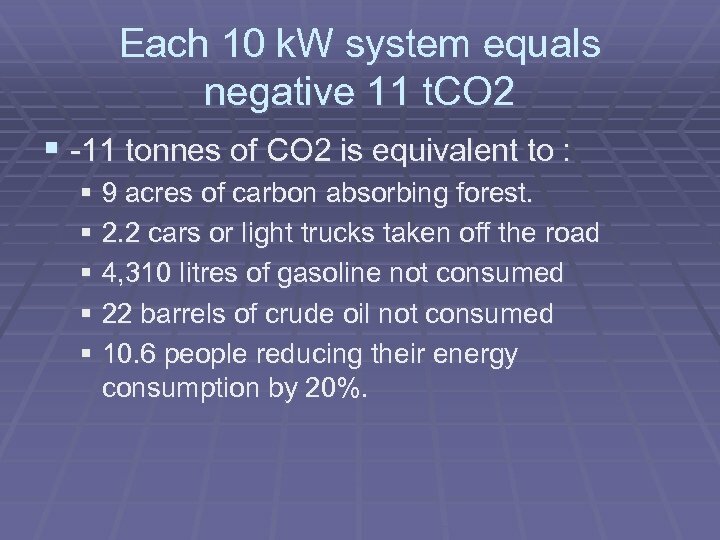 Each 10 k. W system equals negative 11 t. CO 2 § -11 tonnes of CO 2 is equivalent to : § 9 acres of carbon absorbing forest. 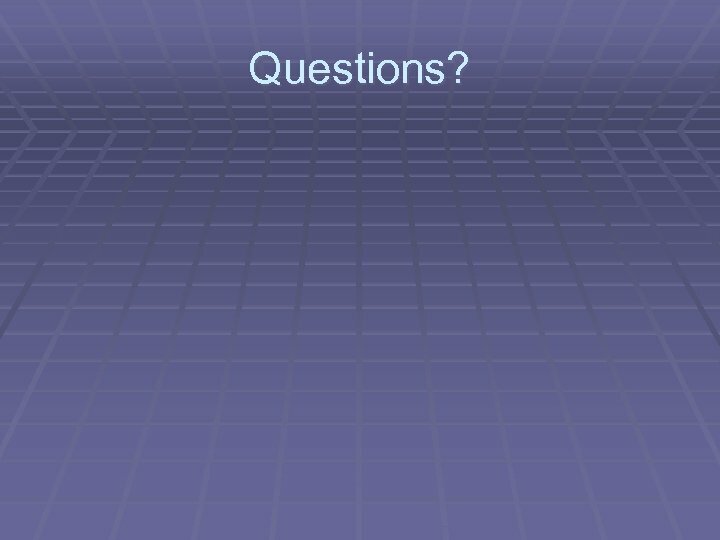 § 2. 2 cars or light trucks taken off the road § 4, 310 litres of gasoline not consumed § 22 barrels of crude oil not consumed § 10. 6 people reducing their energy consumption by 20%. Just Think…. 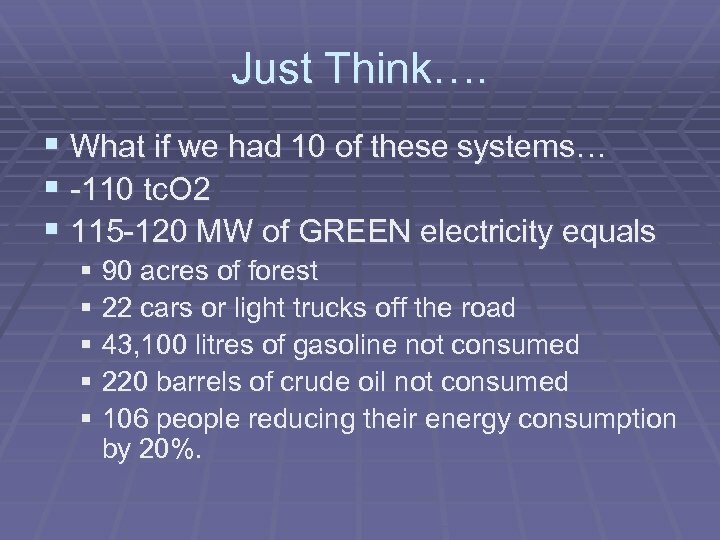 § What if we had 10 of these systems… § -110 tc. 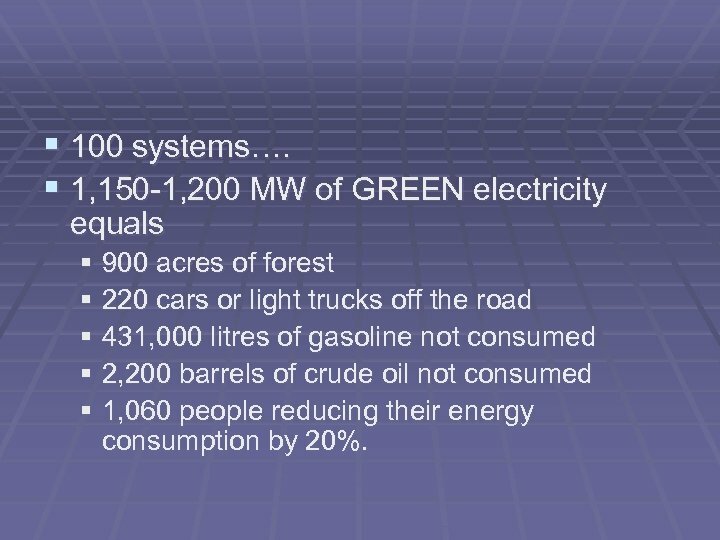 O 2 § 115 -120 MW of GREEN electricity equals § 90 acres of forest § 22 cars or light trucks off the road § 43, 100 litres of gasoline not consumed § 220 barrels of crude oil not consumed § 106 people reducing their energy consumption by 20%. 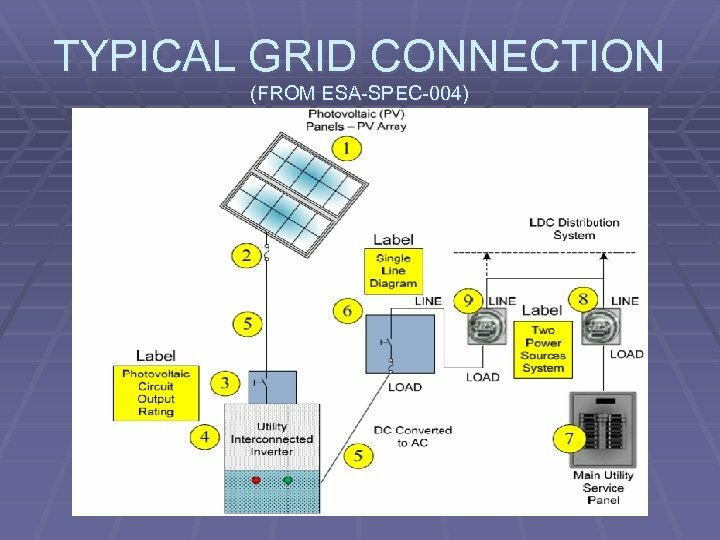 § 100 systems…. § 1, 150 -1, 200 MW of GREEN electricity equals § 900 acres of forest § 220 cars or light trucks off the road § 431, 000 litres of gasoline not consumed § 2, 200 barrels of crude oil not consumed § 1, 060 people reducing their energy consumption by 20%. 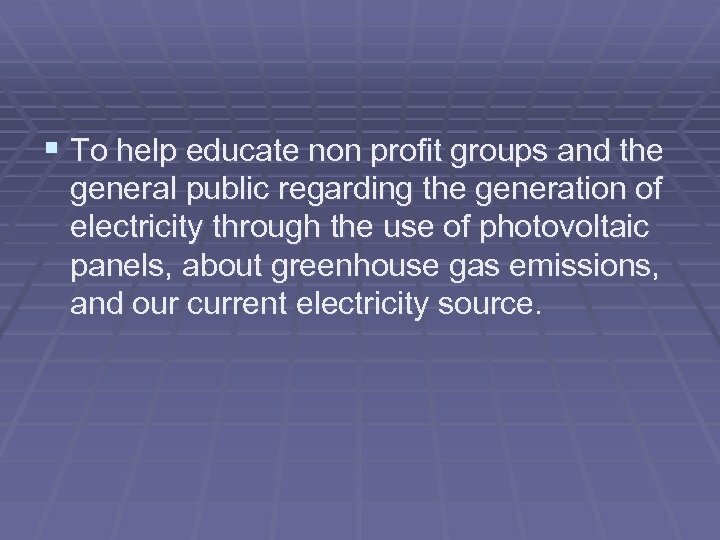 § To help educate non profit groups and the general public regarding the generation of electricity through the use of photovoltaic panels, about greenhouse gas emissions, and our current electricity source. 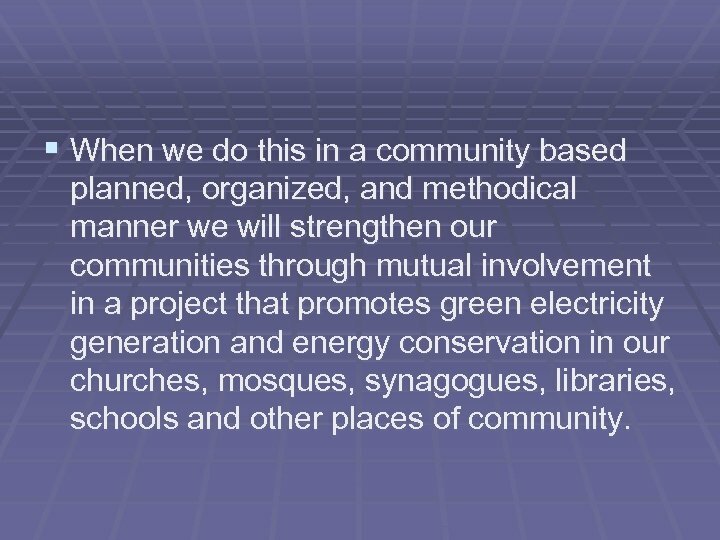 § When we do this in a community based planned, organized, and methodical manner we will strengthen our communities through mutual involvement in a project that promotes green electricity generation and energy conservation in our churches, mosques, synagogues, libraries, schools and other places of community. 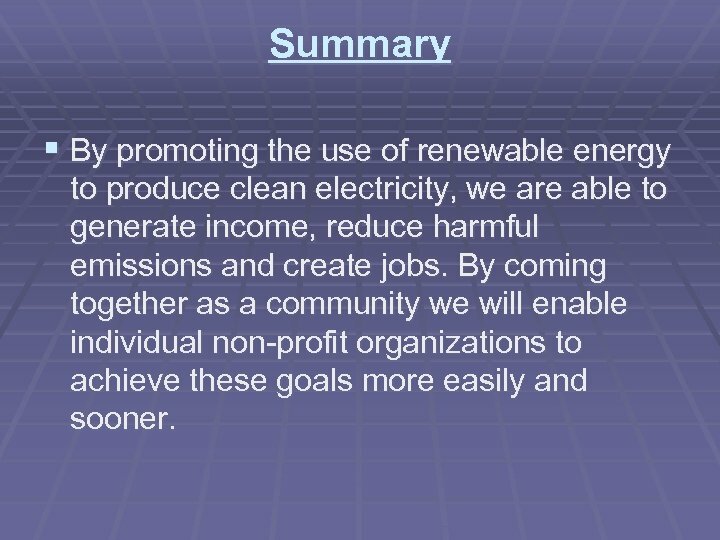 Summary § By promoting the use of renewable energy to produce clean electricity, we are able to generate income, reduce harmful emissions and create jobs. 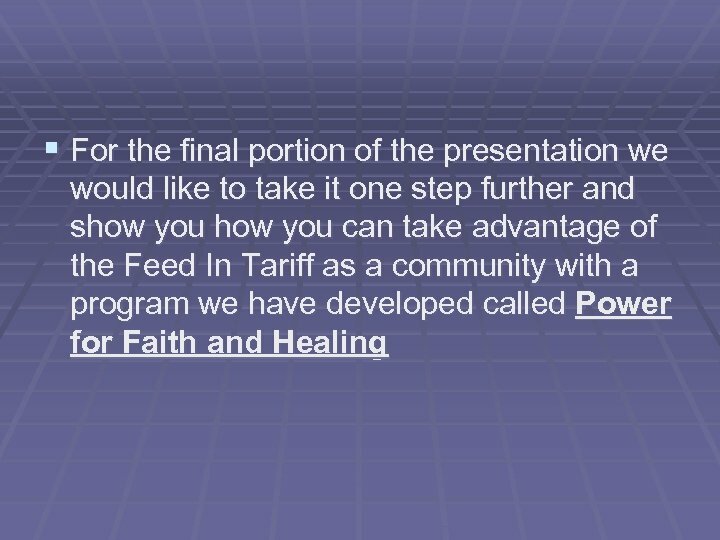 By coming together as a community we will enable individual non-profit organizations to achieve these goals more easily and sooner. 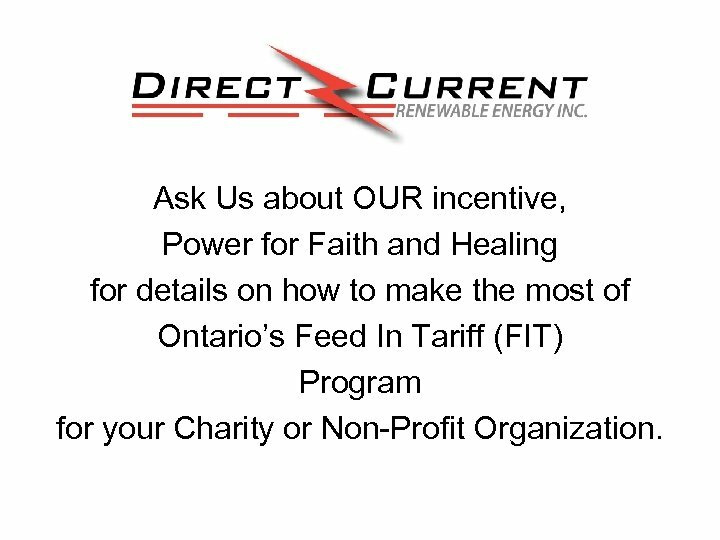 Ask Us about OUR incentive, Power for Faith and Healing for details on how to make the most of Ontario’s Feed In Tariff (FIT) Program for your Charity or Non-Profit Organization.